There are many ways to increase the “bird appeal” of your yard, the local park, or your school yard. It can be as simple as providing water. Birds need sources of clean, fresh water, and a birdbath can provide a welcome source even in a barren setting. Birds also appreciate cover – some shrubbery or other small plants or trees surrounding the birdbath can increases the birds’ sense of security and enhance their drinking/bathing pleasure. If your yard is amenable to planting, then there are numerous shrubs, trees, and forbs that can be planted that attract various birds. Bird feeders can also be used to good effect, especially if different types of feed is included and the birdfeeders are spaced to minimize competition. To begin, REVIEW How to Attract Birds to Your Yard from the Cornell Lab of Ornithology. Of course the most stressful time for our resident birds is winter. Food sources may be scarce and sources of water even more scarce as puddles and ponds freeze over. Gary Swant, local birder extraordinaire, published “Winter Birds in the Big Sky” in the Montana State University Extension Agency publication Big Sky Small Acres, winter 2009. A very effective way to increase the frequency of our feathered visitors is to provide appropriate nesting habitat. 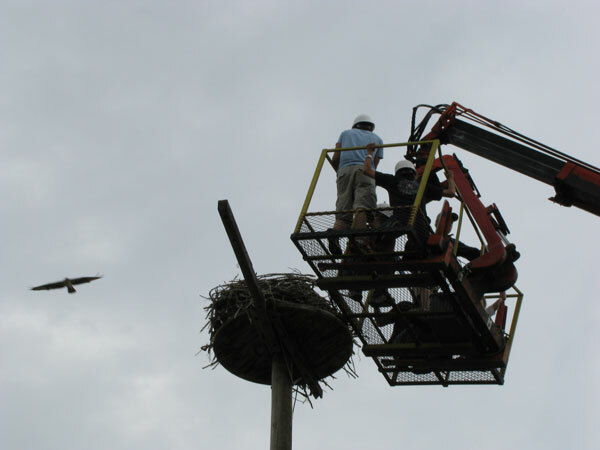 An excellent example of a successful nesting enhancement program has been the placement of nesting platforms for raptors like eagles and osprey. These platforms are often placed to encourage these magnificent birds to avoid power poles. Figure 6.82: Osprey platforms like the one pictured here on the Clark Fork River encourage raptors to avoid power poles, and also provide raptor scientists with additional opportunities for research. A group of researchers associated with the Rocky Mountain Research Station in New Mexico published a chilling report on the number of raptor and raven casualties associated with power poles in northwestern Chihuahua, Mexico. The researchers found the intact remains of 27 raptors and 15 ravens whose deaths could be attributed to electrocution. The Billings Gazette published a report on the shocking number of eagles killed in Wyoming because of power poles – over 1000 documented deaths since 1991. Refer to the article Utility to pay for bird deaths for more information. Appropriate nest platforms can mitigate the dangers to these birds. Again, there are some great websites that provide specific plans for specific birds. The depth of the box, the size of the box, and the size of the entry hole all help to determine which birds might call your nest box home. To get started, REVIEW “Bird Boxes: Hints For Attracting Birds With Nesting Boxes” from the Audubon Society. Then, for thorough plans and instructions on bird box construction, REVIEW “Building Nest Structures, Feeders, and Photo Blinds for North Dakota Wildlife”. Begin with the plan for a nest box designed for black-capped chickadees and white-breasted nuthatches (on page 7 of the larger document).